Perhaps it was the warm Riviera sun which shone all week, or the bustling crowds waiting to get inside the Palais des Festivals each morning. Whatever it was, the mood at the TFWA World Exhibition was definitely more upbeat than I’d been expecting given the long list of challenges the duty-free business faces currently faces. In case you’d forgotten, that grim catalogue includes the Ebola crisis, declining spend among Russian and Chinese travellers, and squeezed margins caused by spiralling airport rents. It helped that the show got off to a good start with Monday’s opening conference. 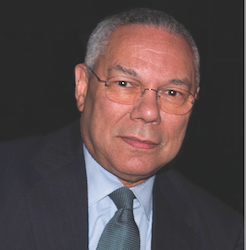 He may have known zilch about travel retail, but former US secretary of state General Colin Powell made for a great keynote speaker, robustly defending his government’s controversial decision to invade Iraq in 2003, and speaking out against racism and the need for more balanced immigration policies. By all accounts the retired politician also made a great impression after the conference, taking the time to come on to the stands and chat to exhibitors and buyers rather than dash off home to cash what must surely have been a sizeable appearance fee. As for the show itself, it attracted a record number of visitors, up 6% on 2013 to 6,701, according to organiser TFWA. Yet looking behind those headline figures I sensed a marked shift in emphasis from recent years, which no doubt reflects the changed trading climate. For starters there were fewer luxury decanters and intricately decorated mahogany gift boxes on display with their invariably stratospheric price tags. In their place were some more modestly priced travel retail-exclusive collections from brands such as The Dalmore – better known in more recent times for the release of much higher-priced ranges. There was also a more business-like feel to many of the press receptions at the show with executives firing up old-school Powerpoint presentations sprinkled with facts and figures. After the boom years you got the impression it was time for brand owners to roll up their sleeves and work much harder to separate travellers from their hard-earned money. The truth is the man certainly knows how to work a room, making sure he shook everybody’s hands on his arrival at the press reception (including the hotel waiter) and clinking glasses with everyone to toast the whisky’s success. He was also quick to counter suggestions that Haig Club was just a superficial money-spinning venture trading off the Beckham name. He talked convincingly about his grandfather’s love of Haig Dimple and Haig ashtray and his own growing interest in Scotch whisky.